Encourage bike-friendly communities. Year after year, residents and visitors alike will have a secure spot to park their bicycles when you add a quality Madrax commercial bike rack to your space that encourages cycling. Save time and money. 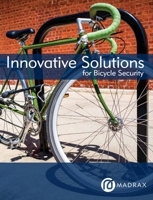 Spending just a few minutes on our website can save you hours of research—and in the end, installing durable and long-lasting Madrax bicycle parking solutions will eliminate the need to replace them frequently. Give a distinct personality to your environment. Adding a Madrax commercial bike rack, storage locker, or customized or branded rack to your project will not only turn heads but also keep your property competitive. Madrax has assisted many architects and engineers, facility owners and managers, schools and universities, municipalities and members of the general services administration in finding the best possible bike rack solutions that fit their needs or their client's requirements. We're proud that our distinct designs are shaped, welded, assembled, and finished not along an assembly line, but one at a time by our skilled craftsmen.